I was planning to finish and post my Urban Decay NAKED Smokey Palette swatches and review today but I need to finish some of the writing and I have a bad attitude and I don't feel like working on it so... Nail polish it is. KB Shimmer Stark Raven Mad (seems appropriate, considering... ) is a stunning deep charcoal linear holographic which my stupid camera, of course, butchered all to smithereens. This polish is absolutely glorious, in person. The formula is KB Shimmer fabulous. This one is a tiny bit streaky on the first coat but evens out to smooth, opaque perfection by the second. There is no running, pooling, dragging, bubbling or running. Try to keep this off of your cuticles, if you can as the intense black pigments tend to grab. Have a little acetone and a cleanup brush ready to catch any outliers before they can cause you trouble. I topped this with Clearly on Top Quick Dry Top Coat, A top coat of which I'm growing extremely fond. 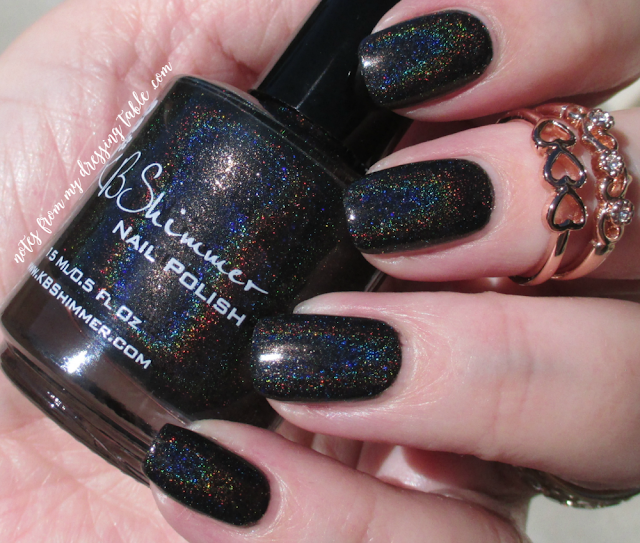 What do you think of KB Shimmer Stark Raven Mad? Me, I'm digging it. Okay. I need another cup of coffee and a serious attitude adjustment. I really do want to get that NAKED Smokey palette review up. KB Shimmer What are You Wading For? My First Rocksbox What Do I Think? Great Reads by Great Bloggers! Round Up the Best Beauty Blogs and... Read!